Now it is time to step back and take a good look at this painting. I want to be sure I am not overworking some areas. 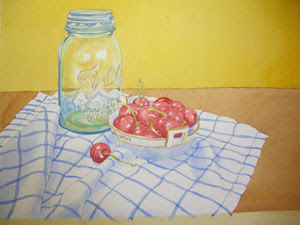 I like to keep the painting at the same stage of development throughout. 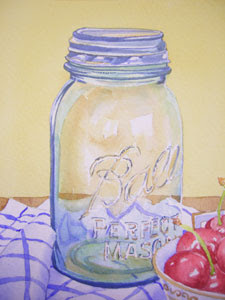 As I study this piece I can see that I can add some darker values to the jar. I painted some of the warm colors used earlier in to the details of the lettering on the jar, saving the whites for where the light is hitting it directly. I added some Prussian Blue to some of the darker shadow areas around the piece including the bottom edge of the white dish.